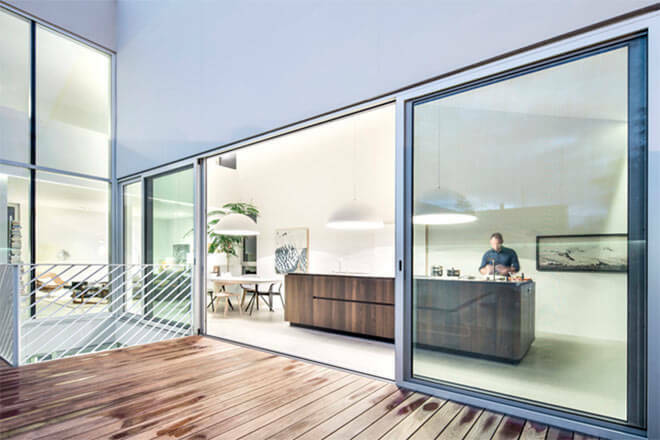 Passive design is a sustainable building standard that responds to local climate and site conditions to maintain a comfortable temperature in the home. It focuses on renewable sources of energy such as the sun and wind to provide household heating, cooling, ventilation and lighting. Through passive design, energy usage is dramatically reduced, temperature fluctuations are fewer, and indoor air quality is improved. Usually, approximately 40% of household energy is used for heating and cooling (even more in some climates), and this can be cut to almost zero in new housing through sound climate responsive design. It costs little or nothing to incorporate passive design into a new building. Simulation tools can provide crucial help in assessing and maximising the impact of different design decisions. In existing buildings, some passive design features can be incorporated during later upgrades, and it may be possible to alter room layout to improve orientation and solar access, but the benefits are certainly greatest when passive design principles are incorporated into the entire design. Given the expected significant changes to the climate over the coming years, new homes should be as climate responsive as they can be. So it’s no surprise to us that passive design has been described as ‘the future of building’. In 1988, two men – Professor Bo Adamson of Lund University and Dr Wolfgang Feist of the Institute for Housing and the Environment – had a vision. 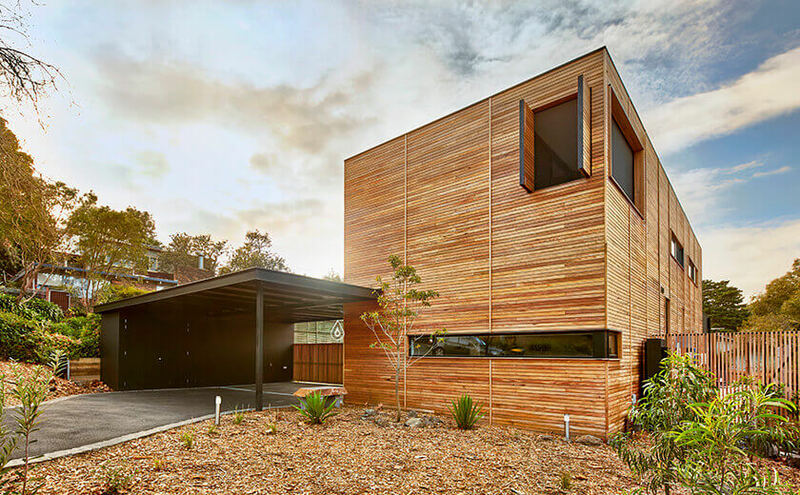 Their vision was to create a home that provided comfort, affordability, excellent air quality/ventilation and reliable performance, without compromising on design. Their journey to discovery changed the face of low energy developments and architecture, and the principles they discovered (known as the Passive House standard) today deliver enormous benefits to both people and the planet. The first Passive House residences comprised of a row of four terraced houses built in Darmstadt, Germany by the architectural firm Bott, Ridder and Westermeyer. They became the first inhabited multi-family homes to achieve a record heating energy consumption of below 12kWh/(m2a) – just 10% of a standard home at that time. 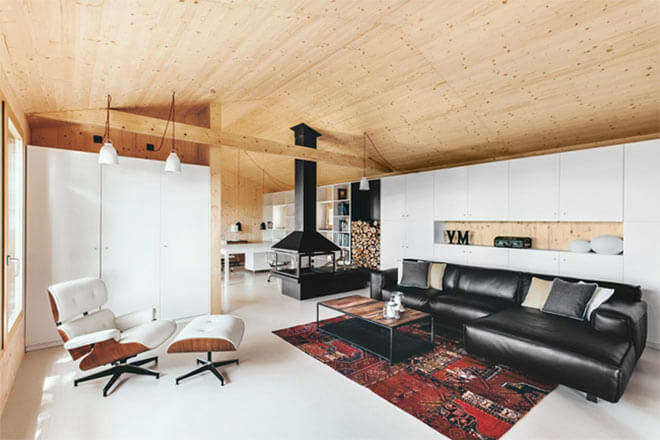 The definition of “The Passive House” placed an emphasis on buildings which require an extremely small heating or cooling energy demand, even in a central European climate. Today, the Passive House standard has become a worldwide phenomenon. There are now more than 50,000 buildings certified to the Passive House standard, with thousands more low energy developments inspired by the model. But passive design is not a new concept. Principles of passive design have been applied since ancient times – long before it was given the name we use today. Traditional residential dwellings in Southern China and Ancient Greece were said to consider factors such as solar orientation, thermal mass and ventilation. Greek philosopher Socrates was quoted as saying, “Now, supposing a house to have a southern aspect, sunshine during winter will steal in under the verandah, but in summer, when the sun traverses a path right over our heads, the roof will afford an agreeable shade, will it not?”. As for the Chinese, they long had strong cosmological traditions associating the south with summer, warmth, and health. Where your home will be located can greatly determine the passive design of your home, as you need to bear in mind the climate of the location. In Australia, each of the main eight climate zones has its own climatic characteristics, which determine their own design responses. The first step is to identify the climate zone and gain an understanding of the principles of thermal comfort so you can make informed design decisions. Climate was extremely important when designing the MARTaK Rest/Work Space in Colorado. 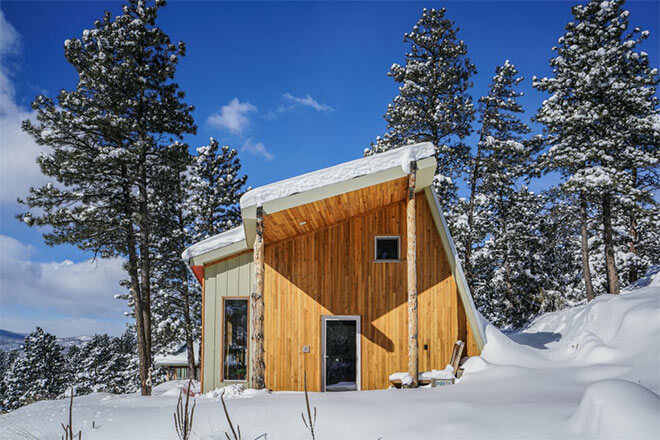 Built off-grid in a mountain forest, the house uses only solar energy for electricity and primarily for heat (with a small back up hydronic system). For hot summers, they kept the surrounding Ponderosa Pines in position to provide shading. For winter warming, there is strong insulation and an airtight layer. The passive house standard requires a leakage test of .60 ACH to 50 Pascals or less to help avoid energy loss, mold growth and moisture build up. This project hit .45 ACH at 50 Pascals, or roughly the equivalent of 8 square inches of total opening in the entire envelope. Orientation refers to the position in which you place a home on its site, and can be used to take full advantage of features of the climate, such as the sun and cooling breezes. In all but tropical climates, Australian living areas ideally face north to allow for maximum exposure to the sun in winter, while receiving shade to walls and windows in summer. Accounting for seasonal variations in the sun’s path, as well as the direction and type of winds, will make for a more comfortable home that’s less expensive to run. 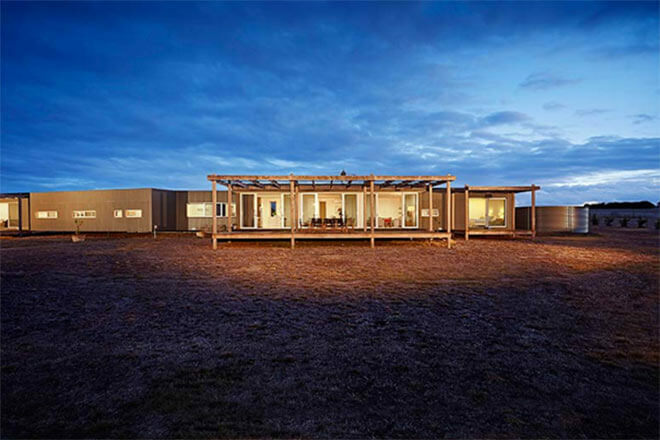 Modscape’s Geelong passive house features two modular accommodation wings. Site orientation was key to the design of Modscape’s passive house in Geelong. 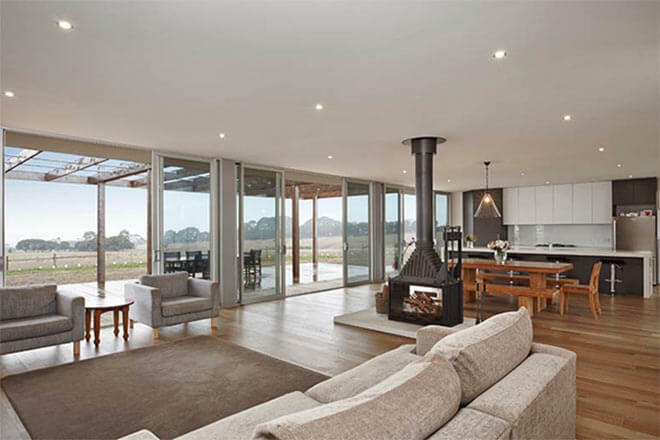 Our client wanted to take full advantage of the 180 degree views of Victoria’s Western District farmland, at the same time as optimising passive solar design. By bending the axis of the house to follow the contours of the land, our design was able to take full advantage of the block’s Northern orientation, whilst also maximising the amazing views. To complement the home’s capacity to function as a sustainable house, it also features solar hot water, a waste treatment system, 5-star energy rated appliances and fixtures, LED lighting throughout and a 120,000 litre Rhino rainwater tank. The right shading of a house and outdoor spaces is important in passive design to help reduce summer temperatures, improve comfort and save energy. Through use of eaves, awnings, shutters, pergolas and plants, you can block up to 90% of the heat generated from direct sun (which can be as much heat as a single bar radiator over each square metre of a surface!). It’s important, however, not to block winter sun with your shading, and this can be done by calculating the sun’s angles in your location. 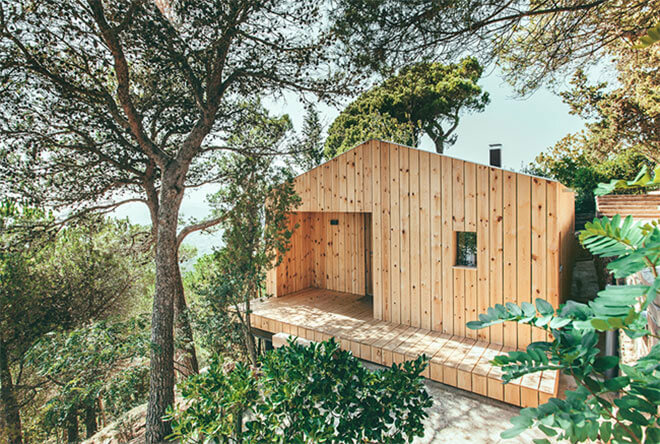 When creating their Wood Studio House on a hillside in Spain, Dom Arquitectura used orientation as well as plants and overhangs to produce enough shading to keep the house cool in summer. Deciduous trees produce shaded areas on the front balcony, the south elevation protects openings against summer sun, and the roof overhang prevents direct sun in the studio. The overhang design and placement also allows winter sun to enter the interior spaces, helping to heat them. In passive design, rooms and outdoor spaces should be laid out to maximise comfort during use. In general, this means the main living areas (such as living, dining and family room) should face north and have all day sun. They may require horizontal shading to prevent overheating in summer, but this ensures good solar gain in winter. For kitchens and breakfasts areas, east-facing rooms are ideal. This offers good morning light, solar gain in the morning, and cool afternoons during meal preparation times. Bedrooms should also face east, making for more comfortable summer sleeping. West-facing rooms have good afternoon daylight, but can overheat throughout the year. South-facing rooms are generally not suitable for habitable spaces as they have little or no heat gain and offer poor natural light. 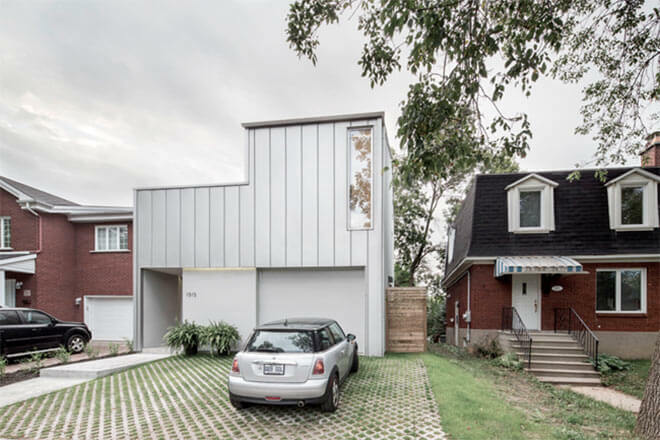 For architect Thomas Balaban, designing the aluminium-clad Holy Cross House in Montreal was no easy feat. He says their biggest challenge “lay in bringing light to the living spaces, given the tight nature of the lot and the availability of direct sunlight limited to its centre.” To deal with these challenges in designing the layout, the architect flipped the traditional vertical hierarchy of two-story homes to create a series of spaces that provide optimal amounts of natural lighting. For example, the main living room was moved to the middle of upstairs, maximising direct sunlight while maintaining privacy. Rooms are organised around a three-tiered courtyard that allows daylight to funnel through to every storey. Thermal mass is the ability of a material to absorb and store heat energy. A lot of heat energy is needed to change the temperature of high density materials such as concrete, bricks and tiles – materials said to have high thermal mass. Lightweight materials such as timber have low thermal mass. Good use of thermal mass moderates indoor temperatures by averaging temperature extremes, so it is particularly beneficial where there is a big difference between day and night outdoor temperatures. It’s important to note though that thermal mass does not provide an alternative for insulation. Thermal mass stores and re-releases heat, while insulation stops heat flowing into or out of the building. In Texas, where the high plains can see wide temperature fluctuations within a single day, thermal mass is of extreme importance in passive design. 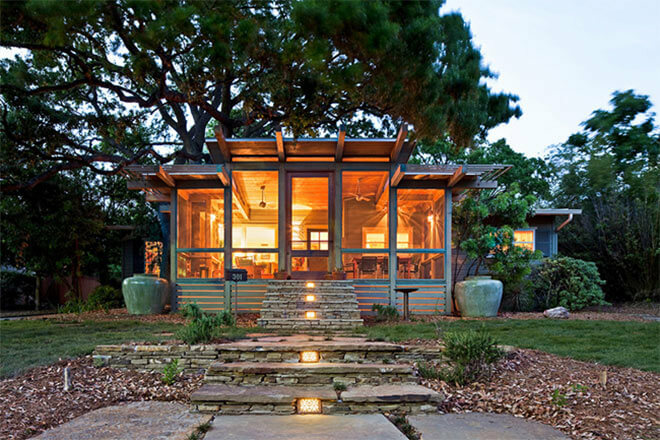 Luckily, John Grable Architects got it right when they renovated this 1950s timber home. The Treehouse Porch project involved building a new porch out of western red cedar, which is ideal for deflecting Texas’ vicious summer sun. 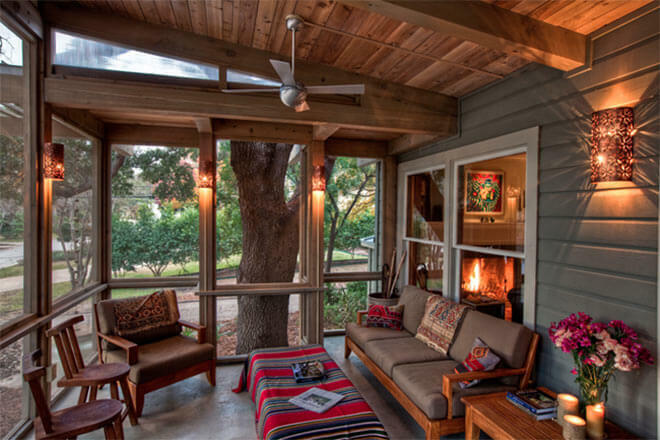 A concrete floor provides thermal mass for the winter and the south-facing, screened porch makes use of prevailing winds in the summer. 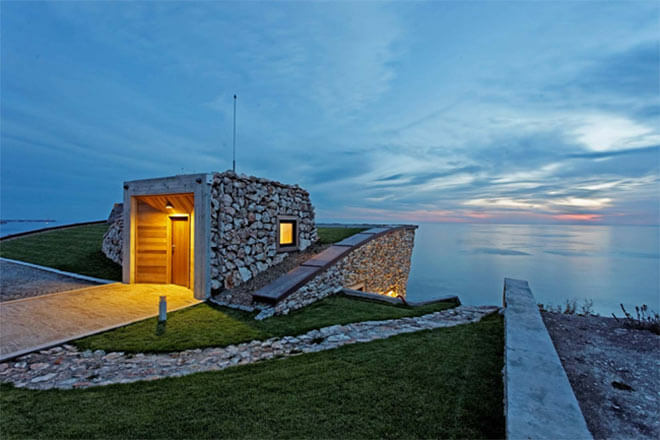 Passive design makes use of the natural forces of wind and buoyancy to deliver fresh air into buildings. Fresh air is required to eliminate odours, provide oxygen for respiration, and to increase thermal comfort. The specific approach and design of natural ventilation systems will vary based on building type and local climate, and ventilation depends critically on the careful design of internal spaces, as well as the size and placement of openings in the building. 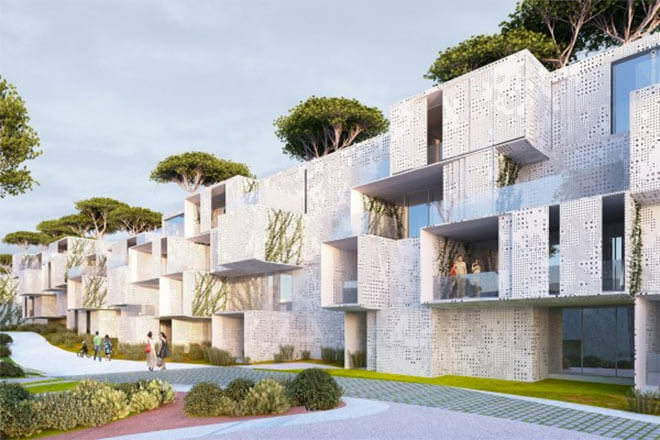 A great example of using natural ventilation in house design is this social housing project in Morocco. 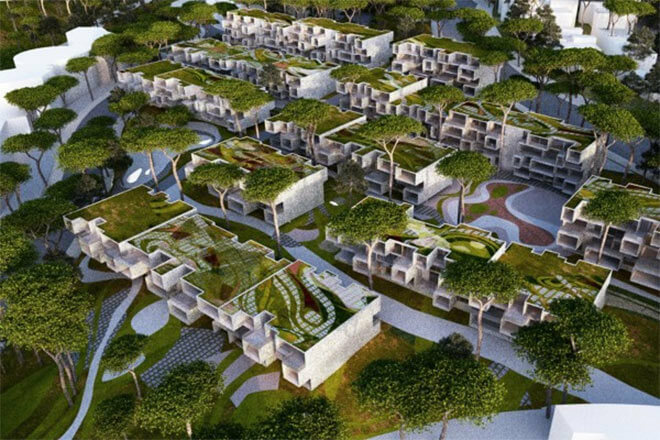 Malka Architecture used four modular prefab units, each equipped with loggias and terraces to allow air to flow through. As an additional benefit, the units also allow natural lighting to reach the most remote corners of the interior spaces, while providing beautiful views of the Atlantic Ocean. During summer, a shading system controls solar gain and ensures the buildings’ optimal bioclimatic performance. Windows and doors offer light, fresh air and views of the great outdoors, but they can be a major source of unwanted heat gain in summer and heat loss in winter. In fact, windows can be responsible for the loss of up to 40% of your home’s heating energy, and up to 87% of your home’s heating gain. Improving window’s thermal performance and ensuring smart window design will reduce both your energy costs and your greenhouse gas emissions. 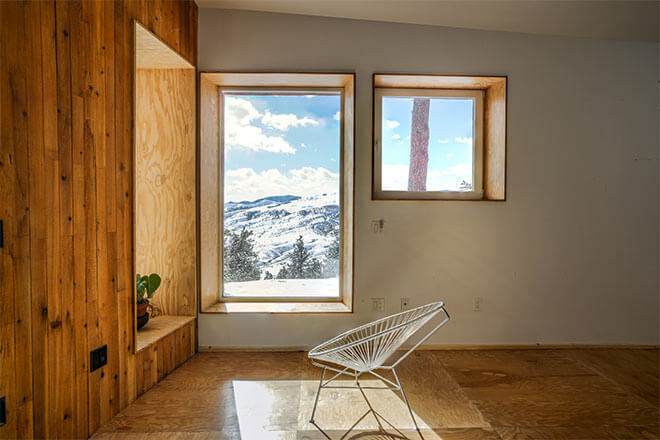 Size, location and glazing systems need to be considered when designing passive windows. 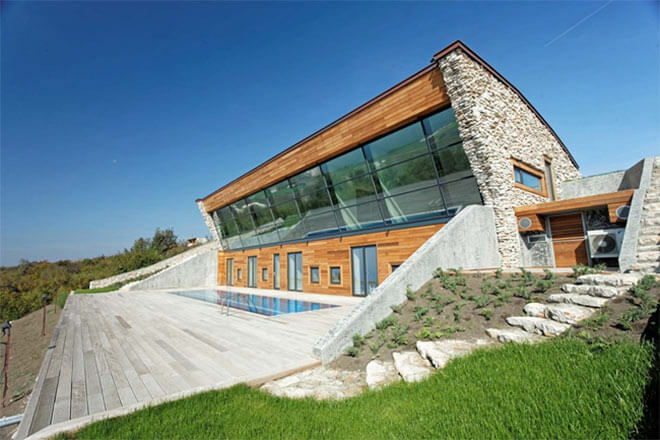 When creating the Equinox House, the architects at Bignatov aimed to blend a private space with the surrounding nature. On the middle level, outward-angled windows take in different amounts of sunlight at different times of year, optimising the lighting inside for each season. During times of the day when heat is needed most, sunlight is able to passively heat the house, whilst the shadows cast by the overhanging roof at high noon keep things relatively cool on hot days. Insulation acts as a barrier to heat flow and is essential for keeping your home warm in winter and cool in summer. The amount and type of insulation your home requires will depend on climatic conditions and your desired goals, and you’ll need to keep in mind the seasons and daily temperature variations. Different design decisions will be relevant if insulation is predominately needed to keep heat out, keep heat in, offer soundproofing or help eliminate moisture problems. Insulation must work alongside other passive design principles for it to achieve the desired results. For example, if insulation is installed but the house is not properly shaded, built up heat can be kept in by the insulation, creating an ‘oven effect’. 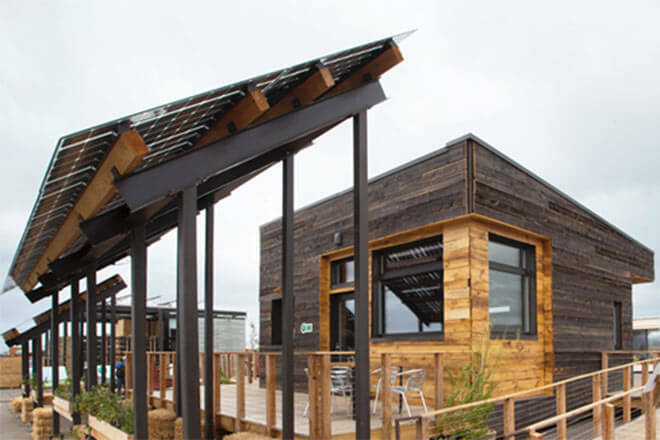 The US Department of Energy Solar Decathlon challenges teams of college students to design and build solar-powered houses that are cost effective, energy efficient, and attractive. 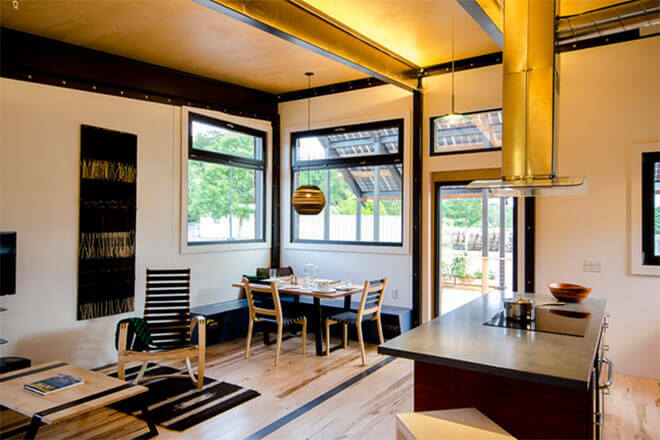 The 2013 team from Middlebury College guided the design and construction of an award-winning net-zero home called InSite. The house features 14-inch thick walls stuffed with blue jean (cellulose) insulation, which keeps the building warm during Vermont’s bitterly cold winter months. 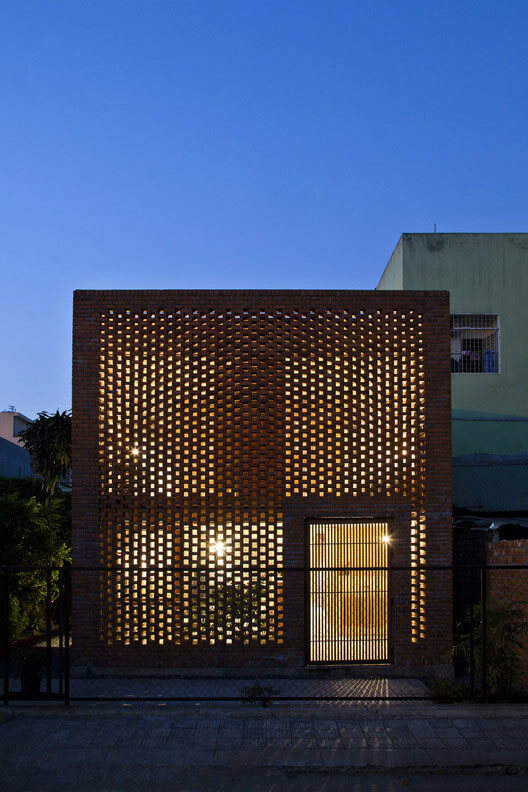 The team also used the wall thickness to create window seats and shade windows on the southern end of the home. An overhanging roof terrace creates a transition zone between the street and interior, and a north-sloping sedum roof provides further insulation and storm water runoff. Skylights can be an excellent source of natural light and can admit more than three times as much light as a vertical window of the same size, while improving natural ventilation. Skylights are a good alternative when you are restricted by the size of windows you can use or when privacy is an issue. They can also offer a unique architectural outlook. 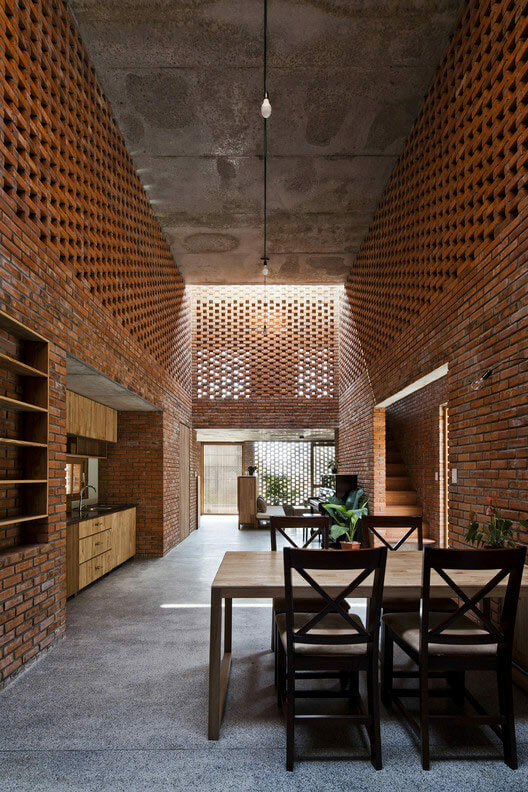 For Vietnamese architects Tropical Space, skylights were an integral part of their design for the passively-cooled Termitary House. Refurbishing an old house to reference sacred sites in the region and the “architecture” of termite nests, the home features long skylights running along the height of the central space, giving views of the sky and garden that can be enjoyed from every room. 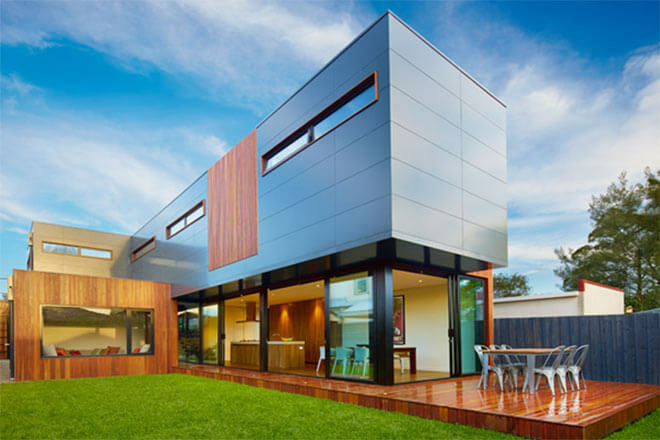 Modscape homes take advantage of the Australian climate to maintain comfortable temperature ranges in the home, while reducing the need for auxiliary heating and cooling. Our homes minimise environmental impact, maximise year-round comfort, and reduce running costs by using shading, ventilation, glazing, orientation, smart window design and insulation. High thermal insulation (SIPs, double glazed windows) and cross-ventilation is utilised, while any high glazed areas are controlled with screening. All Modscape homes meet 6 star energy rating requirements before leaving our factory, however once installed, it’s common for them to achieve a much higher energy rating. Want to see more designs from Modscape? Browse our residential projects here.